My 7 1/2 year old daughter is obsessed with watching TV. She has a number of favorite shows that she wants to watch on a daily basis. As a result, we have to monitor and limit the amount of time she's able to watch TV. The 123GoTV incorporates two of the things that our daughter enjoys the most, watching TV and riding her bike. Combining the two is the perfect combination and a win, win situation for her and for me! My daughter loves the 123GoTV by KidExerciser because it's FUN! I love it because it keeps … Read Moreher active. Being able to let her do what she loves just a little bit longer is a great feeling. Now she can watch TV and I don't have to feel guilty about letting her do so just a little bit longer each day. The feature I love most about 123GoTV is that if my daughter stops pedaling her bike then the TV stops! She has to keep pedaling and exercising in order to watch her favorite TV programs! Our family lives an active lifestyle and we enjoy the outdoors. Being able to bring that activity inside is an added bonus! Especially now that the weather is getting colder, snow it on its way and my kids can't go outside to ride their bikes. 123GoTV by KidExerciser has earned the coveted Parent Tested Parent Approved (PTPA) Seal of Approval. KidExerciser’s mission is to improve kids’ health and fitness by providing an easy and fun behavior-based method for increasing activity. 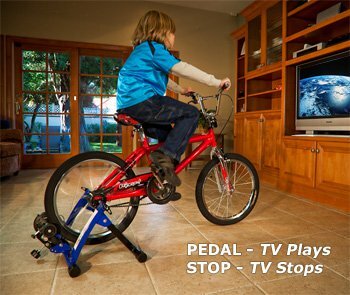 Our kid’s fitness product, 123GoTV, uses your child’s own bike as an indoor exerciser that controls the TV feed. Pedal-TV plays. Stop pedaling-TV pauses. KidExerciser is committed to supporting methods for kids to get and stay fit by encouraging healthy behavior in their developing years. Suggested Retail Price: $199.00 - use promo code "PTPA" for 20% off! I love that it wirelessly connects to the TV. I agree with you. I like the fact that the TV stops when they stop pedaling. It's an incentive to keep exercising. I love the fact that the t.v stops when you stop pedaling. Great idea to get kids more active and into exercising. i learned it connects to the tvsource- it's wireless! I could use it to! I love that you have to pedal to activate the tv, and when you stop, the tv stops. I love that you have to Pedal to activate TV. I see that the Founder Margie Mullen had 20 years as a business owner! The connection to the TV looks really easy. I learned that exercise reduces the risk of diabetes. I learned that this idea came about after a comment her spouse made to her about their son and exercise. I learned that when 123GoTV is property installed, there is no need to un-install it. I learned that it's a wireless connection. I love all of the health benefits even including quality of sleep. I love that they have to pedal in order to watch the tv. I need one of these for myself! Heh. I love that the kids are playing and don't really realize they are exercising!!! i love that it improves the quality of sleep.. I learned this: "Margie Mullen has spent her career primarily in the financial services industry. Since 1991 she has been the president and CEO of Mullen Advisory, where she provides comprehensive financial planning and wealth management to 50 clients. For five years, Worth Magazine named her as one of the top financial advisors in the nation. A native of Los Angeles, she earned her bachelor's degree from California State University at Los Angeles. She is the parent of a teenager, very active in her church, and a diehard Dodgers fan."